Hey guys! I'm super excited to start PA school in May 2019! With that being said, I'm curious to know what your favorite books are to prep for the exams/PANCE? Some of the first year PA students I've talked to recommended Netter's Atlas of Human Anatomy, Blueprints Medicine, and PANCE Prep Pearls. I'm keeping these suggestions on the back burner until PA school starts & if I need some additional information. I would appreciate any other recommendations, thanks! A lot of my classmates liked to use this book to review topics for EORs. The following are books I actually own physical copies of and find very useful. BRS Physiology to study for physio exams. This book is hands down the single best review book for PA school that exists. It is bulleted review but often it has everything you need. The review questions at the end of each chapter are excellent. Very occasionally I will read the bigger version of this book: Physiology by Linda Costanzo to get a more thorough explanation. First Aid for USMLE Step 2CK is good to review for clinical medicine exams. Beware it sometimes has typos or is outdated in treatments and guidelines. Another good options is Comprehensive Guide to Certification and Recertification of PAs. For our pathology/pathophysiology exams, I skim Robbins Basic Pathology, and/or watch Pathoma videos (google it, you have to pay but it is worth the price). Osmosis videos on youtube are also helpful for both physiology and pathophysiology. Rapid Interpretation of EKGs by Dale Dubin is the only EKG book you will need, and a physical copy of this one is good because it is a fill in the blank as you read type of thing. That all being said, most of my reading is done online in UpToDate and also through our libraries electronic resources (we can get to all the big medical textbooks like Harrisons and you will probably have something similar once you get set up with a login for your school). You do not need many physical books and I'd talk to current students to see what review books are good for your program specifically. Selling both Andrew Rodican books, both paperback. 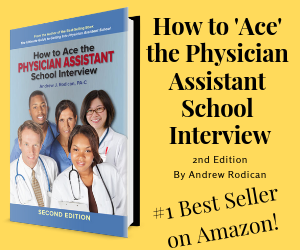 "The Ultimate Guide to getting into Physician Assistant School"- 3rd edition. Lightly used/great condition. Only one highlighted section (see photos). "How to Ace the Physician Assistant School Interview"- lightly used. A few highlighted sections, most being pencil. Doesn't interfere with future use of the book. Selling both for $30+shipping to respective area. Books sell for full price for about $30 each on Amazon for new. I would like to sell both at once versus splitting the set. I have them listed on the Facebook marketplace (see link below). You can message me there or here on the forum. Curious if anyone had recommendations for useful gastroenterology books, as I will begin working in an inpatient & outpatient setting in 2 weeks. I would like to study the "basics" so the practice doesn't instantly regret hiring me ;) Any recommendations (or even advice) is greatly appreciated! Thanks! Ideally if someone wanted all of them and I only had to make one trip to the post office, I could sell them all for $95 and I'll even pay the shipping. If I part them out, I'd like to get about half of whatever the going rate is on amazon and I'll negotiate the shipping costs with you. Feel free to PM me or reply here.